The adventures begin in these flattering women’s sunglasses with a square-shaped acetate front and injected temples inspired by the Fossil diamond logo and accented by faux leather inserts. Available in beige with a brown gradient lens, Havana with a brown gradient lens and black with a gray gradient lens. The classic(ish) guy will always be headed in the right direction with the Fossil 6076 optical frame. These vintageinspired rectangular-shaped specs deliver spirited styling in handmade acetate along the brow bar and nose bridge while clean metal lines flank the bottom. Arrow-shaped temples in leatherette, inspired by the Fossil diamond logo, provide a modern vintage twist. Offered in Havana, striated gray and black. It’s easy for (tom)girls to find their fashion compass while wearing these optical frames that easily earn a style badge. These head-turning square-shaped optical frames, fashioned in handmade acetate, are offered in red horn, Havana and black, and are complemented by arrow-shaped temples in faux leather. The Fossil logo and the brand’s iconic diamond shape end pieces are done in high-relief metal for extra appeal. 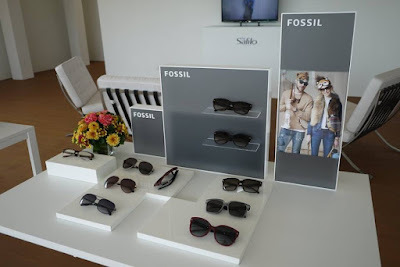 The FOSSIL eyewear collection is produced and distributed by the Safilo Group. All the collection look so class and edgy too! I love the first FOS 20000/L/S, love its leopard pattern on the edge. the collection looks very classic and edgy! love the designs.